This is part two of a two-part blog series discussing Salesforce.com’s strategy to help SMBs better capitalize on technology. Part One, California Dreaming? Salesforce’s Dreamforce SMB Story, provides perspectives from several Salesforce SMB customers. 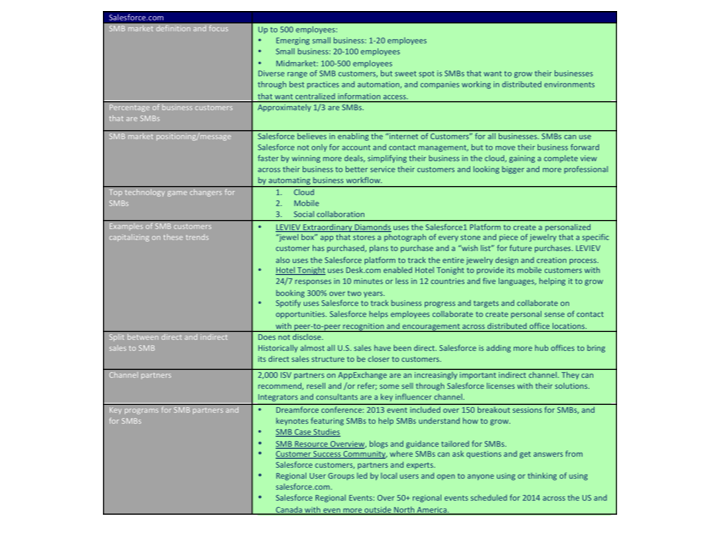 This second post, which is excerpted from SMB Group’s April 2014 Guiding Stars: Vendor Strategies to Bring Game-Changing Technology Trends to SMBs report, provides a more detailed glimpse into Salesforce.com’s approach. But there are lots of vendors and solutions out there ready to help you on your journey, and one-size-fit all doesn’t apply in SMB. Is Salesforce right for you? Read on for information and insights to help you decide. Fifteen years ago, Marc Benioff founded Salesforce with the belief that multi-tenant, cloud computing applications democratize information by delivering immediate benefits while reducing risks and costs. Bring best practices and automation into their businesses so they grow, do more with less and do it better. Gain real-time visibility into their businesses to improve decision-making. Centralize information, making it easy for everyone to collaborate, no matter where they are, and providing a built-in way to retain knowledge as employees come and go. Take advantage of enterprise class security and reliability trusted by thousands of enterprises at an affordable cost that scales with their business. Salesforce views the cloud as the foundation and springboard for SMBs to benefit from other game-changing trends, namely mobile and social solutions. Salesforce believes that mobile is becoming the “new normal” user experience. People are already running their personal lives on mobile devices, and increasingly want to click into apps, dashboards and info on mobile devices for work. To that end, the vendor’s Salesforce1 initiative puts mobile first by making 100% of Salesforce functionality and information available to users in a relevant interface on any device. Social collaboration is also key, not only in terms of marketing, but to help SMBs deliver more responsive service that customers increasingly expect. Social tools and analytics let SMBs increase context about customer and prospect interactions so they personalize how they engage and support them. For instance, Salesforce Chatter can run across everything in Salesforce and some of its partners’ apps, allowing everyone—from the CEO to the receptionist—to get on the same page whether to more readily spot new opportunities or to head off potential problems. Together, these trends make things more transparent. It’s easier for people to collaborate to get the job done, instead of operating in silos. Salesforce introduced its Communities solution, which its customers can use to manage external relationships with customers and partners in a protected or non-protected way, furthering extending social collaboration capabilities from within Salesforce. Rising expectations for centralized, single sign-on access to apps and data, with everything needed to get work done pulled together from different apps for a complete view. Demand for solutions with built-in collaboration capabilities. Business owners see that collaboration helps the business to deliver better customer and employee experiences, because information flows both ways and provides better visibility to make decisions. Customer service as the “new wave of marketing.” Better visibility and engagement with customers has raised awareness about the importance of servicing and engaging with customers throughout the whole life cycle to drive business, leading service people to take more ownership of the brand. “Try before you buy” is the new normal. SMBs now expect to try—without having talk to rep—solutions before buying them. Salesforce cited one customer who wanted to get Desk.com, Salesforce’s small business help desk service, up and running by himself while watching the Super Bowl. Friction-free technology. SMBs increasingly look for a frictionless technology experience. They have less patience for solutions that can potentially take too much time or cost too much money. They want vendors to demonstrate ease of use upfront, and provide transparent pay as you go pricing. Doubled the amount of SMB content at its annual Dreamforce event last year over the prior year, with over 150 SMB breakout sessions, a dedicated networking and expert interaction area, ask the ask experts panels, a dedicated keynote as well as inclusion in other keynotes with SMBs alongside big companies. Will move from one SMB message to differentiated messaging for different types of SMBs and decision-makers, to make it more relevant for different segments and roles. Has recently introduced new SMB resources, including small business blogs, a customer success community. As one of the first true cloud computing pioneers, Salesforce seized on the fact that cloud computing removes the barriers for small businesses to gain the same business benefits from technology solutions as larger companies. Salesforce—via its vision and strong customer proof points—has painted a vivid picture of how SMBs can use cloud, mobile and social solutions offerings for a more user-friendly, streamlined way to run their businesses. At the low end of the market, many Salesforce customers move directly from Excel or from pencil and paper to Salesforce, underscoring both ease of use and the resulting business value of having real-time information access, anywhere from any device. And, even as it’s grown its star-studded Fortune 500 customer roster, Salesforce has kept SMBs in the spotlight, investing to educate the broader market about how they can use and benefit from these technologies. Over the years, of course, Salesforce has also broadened its vision and developed and assembled many more components to enable this vision. For instance, there are now 4 editions of Sales Cloud, 3 of Service Cloud and 4 of Marketing Cloud. At the upper end of SMB, companies may have enough staff, expertise and time to sort through Salesforce’s expanded portfolio, and figure out what’s right for them. But, Salesforce’s story may be getting confusing for smaller SMBs. While entry-level pricing is low, how many small businesses can jump from Group Edition ($25/user/month) to Professional ($65/user/month). While Professional Edition offers a lot more functionality (including pipeline forecast, campaign management, contract storage and quote delivery, custom reporting and dashboards, and a complete view of the customer across sales and service, the price differential is tough for many SMBs to absorb. Alternatively Salesforce does offer desk.com at $29/user/month to customers that have customer service requirements. Again, however, it can be challenging for SMBs to figure out which approach will work best and be most cost-effective. However, Salesforce plans to increase investments to engage SMBs both locally and online. Not only will this help Salesforce educate more SMBs about the power of technology in business, but also it should give Salesforce a wider lens through which it can get a better pulse on SMB requirements. In turn, this should help Salesforce simplify and streamline solution packaging and positioning. All of which bodes well for its potential to help more SMBs understand and use technology as a game-changer. Want to know more about how Salesforce’s SMB customers use Salesforce? Read Part 1 of this blog series, California Dreaming? Salesforce’s Dreamforce SMB Story, for perspectives from several Salesforce SMB customers on how they are rethinking their business models and using technology in their businesses. Previous Previous post: Why Should You Take 3 Days Out of Your Schedule to Attend Dell World?